For over 30 years, instructors around the world have successfully used The Art of Public Speaking to teach the development and presentation of effective speeches. Through personalized and adaptive instruction, the program helps each student think critically, build confidence, and make the leap from learning the principles to mastering competent speaking in the classroom and throughout life. SmartBook®—the first and only adaptive reading and study experience. It highlights content based on what the individual student knows and doesn’t know, and provides focused help at that moment in need through targeted learning resources (including videos, animations and other interactivities.) SmartBook's intuitive technology optimizes student study time by creating a personalized learning path for improved course performance. Connect Insight offers a series of visual data displays that provide analysis on five key insights: (1) How are my students doing?, (2) How is this student doing?, (3) How is my section doing?, (4) How is this assignment doing?, (5) How are my assignments doing? Speech Capture in Connect Lucas gives instructors the ability to evaluate speeches live, using a fully customizable rubric. Instructors may also upload speech videos for the students, create and manage peer review assignments. In addition, students may upload their own videos for self-review and/or peer review. 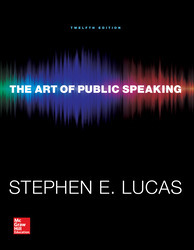 Online Media Library of student speeches on Connect Lucas: Ten full length speeches are new to this edition, along with along with fifteen needs-improvement versions and video clips illustrating key public speaking concepts. The Annotated Instructor’s Edition contains on-page teaching tips, suggestions for class discussions and activities, and cross-references to related teachings, videos, and exercises. The Instructor’s Manual in the Instructor Resources CD includes teaching suggestions, speech assignments, and additional speeches for analysis and discussion. Stephen E. Lucas is Professor of Communication Arts and Evjue-Bascom Professor in the Humanities at the University of Wisconsin-Madison, where he has taught since 1972. He received his bachelor's degree from the University of California, Santa Barbara, and his master's and doctorate degrees from Penn State University. Professor Lucas has been recognized for his work as both a scholar and a teacher. His first book, Portents of Rebellion: Rhetoric and Revolution in Philadelphia, 1765-1776, received the Golden Anniversary Award of the National Communication Association in 1977 and was nominated for a Pulitzer Prize. His major articles include "The Schism in Rhetorical Scholarship" (1981), "The Renaissance of American Public Address: Text and Context in Rhetorical Criticism" (1988), "The Stylistic Artistry of the Declaration of Independence” (1990), and “The Rhetorical Ancestry of the Declaration of Independence” (1998), for which he received the Golden Anniversary Monograph Award of the National Communication Association. His most recent book is Words of a Century: The Top 100 American Speeches, 1900-1999 (2009). Professor Lucas has received a number of teaching awards, including the Chancellor's Award for Excellence in Teaching at the University of Wisconsin and the National Communication Association’s Donald Ecroyd Award for Outstanding Teaching in Higher Education. His lecture course on "The Rhetoric of Campaigns and Revolutions" is among the most popular on campus and has twice been selected for statewide broadcast in its entirety by Wisconsin Public Radio. Professor Lucas is featured in the Educational Video Group’s program on the history of American public address, and he has appeared on the History Channel’s documentary on the Declaration of Independence. Professor Lucas has directed the introductory public speaking course at the University of Wisconsin-Madison since 1973. Over the years he has been responsible for numerous teaching innovations and has supervised the training of hundreds of graduate assistants. In addition to participating in public speaking workshops and colloquia at schools throughout the United States, he has served as a judge for the major national English-language public speaking competitions in China, has lectured at numerous Chinese universities, and has conducted workshops for Chinese instructors on teaching public speaking. Stephen Lucas and his wife, Patty, live in Madison, Wisconsin, and have two sons, Jeff and Ryan. His interests include travel, sports, art, and photography.